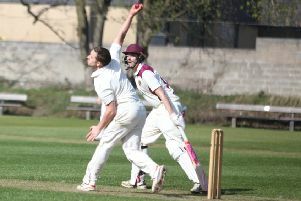 Josh Gale, one of the stars of Walsden’s Lancashire League title success this summer, has signed for Woodbank CC as professional for 2019. The 23-year-old will play for the Bury club in the Greater Manchester League. Gale’s father Kenny, a key man behind the scenes at the Scott Street club, said he and Josh had been to Woodbank to see the ground and talk to the cricket chairman. Josh had also canvassed the opinions of other people, including teammate James Rawlinson who had a spell in the paid ranks with Settle. Kenny said it had been a tough decision, as Josh enjoyed playing alongside long-standing teammates and friends. However, if he turned down Woodbank he might regret his decision in years to come. “It was an opportunity he felt he had to try,” said Kenny. Josh was the league’s top scorer with 817 runs at an average of 40.9 in Walsden’s charge to the title at the first attempt after their switch from the Pennine League. He formed a formidable opening partnership with Jake Hooson - who scored a century for Modewarre CC in Australia last weekend - and eclipsed brother Joe’s amateur club record, set three weeks earlier, when hitting 160 at Bacup. Kenny said clubs in the Greater Manchester League were allowed to pay more than one player and the pressure to perform would not fall only on Josh’s shoulders at Woodbank. While Josh’s departure is a blow to Walsden’s hopes of retaining the title, it will give opportunities to under-used players in the club’s line-up. Stevie Barker and Cameron Hanson have both opened in the T20 competition while long-serving pair Rawlinson and Matt Dawson have plenty of experience of facing the new ball. Walsden’s success this year, with a home-grown team plus Sri Lankan Umesh Karunaratne, was sure to lead to plenty of interest in their players. Kenny Gale said Josh had received a second approach while Hooson and opening bowler Jamie Shackleton had been other targets but were happy at Scott Street. Walsden have lost the toss for the Lancashire League’s curtain raising Ron Singleton Trophy match between the league and cup winners. That means they must travel to Lowerhouse on April 20.